The railroadiana collecting field can be broken down into thirty or forty types of collectibles. Antique Railroad Lanterns are one of the most well known and iconic items you’ll find while collecting railroadiana, but they can be very confusing to new collectors as many lanterns look similar to the uninitiated. The biggest distinction in railroad lanterns are between fixed globe, tall globe, and short globe lanterns, there are also special case items such as presentation lanterns and larger lamps of various types. The most important feature of a railroad lantern though, is the railroad stamp that should be located usually on the dome. Most collectors will stick to lanterns that burned kerosene, oil, or gas and they will shy away from electrical models or even old lanterns that have been converted to electric. While there are lanterns out there that can sell for thousands of dollars, they are very rare and you’re much more likely to see hundreds of lanterns that are worth only $20-30 before you ever see one that is worth over $1,000 unless you’re an advanced collector. In general the most valuable lanterns will be fixed globe or presentation lanterns that can range from hundreds to thousands of dollars. Mid grade lanterns will be tall globe lanterns worth $50 up to several hundred dollars. Entry level lanterns will tend to be short globes which are quite common and worth less than $50 in most cases. Why Do People Collect Antique Railroad Lanterns? People love collecting antique railroad lanterns for many reasons, just one of which is that they are one of the few antiques that you can continue to use and enjoy without damaging them. While most people wouldn’t even consider actually lighting some of these old lanterns, many people do still use some entry level lanterns and even some mid level lanterns as lighting in their homes. Another great feature of lanterns is that they are fairly easy to display and they are easy to identify because almost all lanterns will have the railroad and the manufacturer on them, additionally there aren’t many fakes out there so collecting lanterns can be much safer for new collectors. Another great fact about collecting railroad lanterns is that there is a very good supply of them out there since the railroads ordered and used so many of them. This means that there is a nice progression of lanterns at different price points that can appeal to any collector. The popularity and ubiquity of lanterns throughout the railroadiana hobby is a testament to how iconic the image of the lantern is to the railroads, people understand immediately the connection and attraction to collecting them. How Are Railroad Lantern Values Determined? This is the main question we get here about any lantern. How much is my railroad lantern worth? 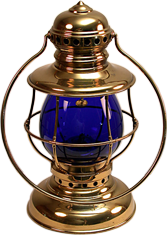 The two biggest factors that affect the value of a railroad lantern are the railroad marked on it and the manufacturer and model of the lantern. Some railroads have many collectors competing for its memorabilia so popular railroads can drive up the value, but by the same token, very small short line or narrow gauge railroads can also command high prices if they are very rare. Collectors also want lanterns from hard to find manufacturers which is why the Keystone “Casey” or similar types of lanterns from small or short lived makers can be very valuable. The age of a railroad lantern is also very important. With railroad lanterns, an older lantern is generally more valuable than a newer one, but this rule has its limits. You’ll find that old lanterns like fixed globes from the 1850s-1870s will be more valuable than tall globes from the 1880s-1920s which will be more valuable than the short globe lanterns that followed after. There are a number of other factors that can make one lantern more valuable than another such as condition, what type of globe it has, and any special features. We would strongly encourage you to work with an expert (like us) to determine an accurate value for your lantern. Adams and Westlake (A&W), Armspear, Brady, Dietz, Dressel, Handlan-Buck (also can be found as Handlan or MM Buck before they merged ), Keystone, Star Headlight & Lamp, and many other smaller and less well known companies. Often one manufacturer was the primary supplier for any given line so often you’ll see only one or two models for a given railroad, especially if it was a smaller line. Knowing the different models a manufacturer produced over time can help you date lanterns more precisely as features were constantly being refined. 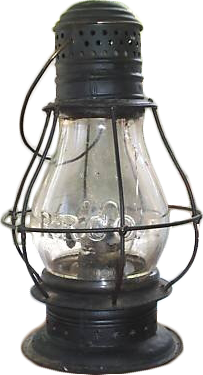 A single “model” of a lantern can be found with over 30 variations in many cases with alterations and options available as to what type of verticals, base, font, globe, and other features were offered by a manufacturer. As we have mentioned several times, antique railroad lanterns can be a lot of money. While it is pretty uncommon for someone to try and fake an entire lantern, there are people who try to increase the value of some lanterns by adding parts from others and trying to pass off the Frankenstein as something more valuable. This often happens if the faker can buy a damaged lantern that would be valuable if it weren’t broken or missing certain pieces, they will then take the marked parts of the lantern and try to put it on a lantern that they could buy much more cheaply. Another common issue is people who will use acid to try and make globes more valuable by etching railroad logos or initials in what were originally blank globes. Forgers and fakers start to ply their trade once the collector values get high. You can protect yourself by only buying from reputable dealers. As will all railroadiana collectibles, condition is important with railroad lanterns. Lanterns that are missing parts like the font or globe will be worth less than those that are complete. Lanterns with issues like rusting, dents, or pitting will also be worth less than those that have been well cared for. With that said, if a lantern has only superficial dirt or wear, it generally will not affect the value as much as with other types of collectibles. So there is a fine line between wear and damage.